Get double the use out of this handy tool. When glass can't be handled comfortably by hand, use the breaking pliers to break glass along score lines. Turn pliers over and use as grozers to nibble glass away from edges. The spring-loaded jaws work easily. A glass cutting necessity. This tool applies pressure to your glass score to help break your glass with ease. Use the convenient centering mark for perfect breaks. The wider jaw provides extra breaking power and is backed by a lifetime guarantee. Perfect for "squaring" glass and cutting straight lines. A small lip at the bottom edge of the square holds your glass in place while you cut. Made with non-abrasive material that will not scratch your glass. 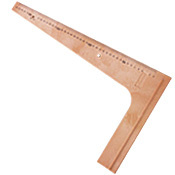 These squares are great for accurately cutting pieces of glass up to 18 inches. Perfect for "squaring" glass and cutting straight lines. A small lip at the bottom edge of the square holds your glass in place while you cut. Made with non-abrasive material that will not scratch your glass. These squares are great for accurately cutting pieces of glass up to 12 inches. It's named after a sailor's knot untying tool, but this fid is indispensable in stained glass work. Widen channels of lead came to fit glass, burnish copper foil, clean excess glazing compound, and so on. You'll find this tool very handy for a variety of uses. Foil roller & burnisher all in one tool. A simple, effective, and affordable tool that will speed up your foiling! Use the crimping groove to burnish the foil onto all edges for a smooth and tight fit. 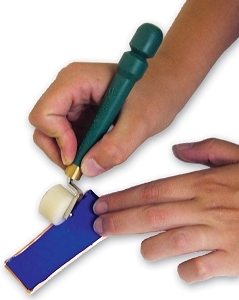 Use the flat roller for smoothing foil of all sizes and shapes of glass. A great multifunctional tool for stained glass work!